Good design is a grand luxury for your North Myrtle Beach vacation. Bluewater Keyes is a terrific North Myrtle Beach resort that is full of design excellence. 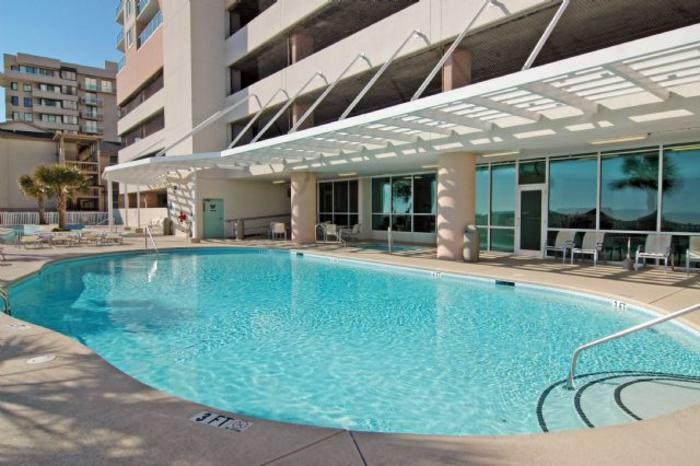 Bluewater Keyes is a 12-story North Myrtle Beach resort where the first five floors are the convenient parking garage and the top seven floors are filled with magnificent North Myrtle Beach vacation rentals. Most of the North Myrtle Beach condo rentals at Bluewater Keyes are on the oceanfront, though some have side ocean views. When you can start each day of your North Myrtle Beach vacation looking at the Atlantic Ocean, you know it is going to be a grand day. That is exactly what you can expect at Bluewater Keyes. This North Myrtle Beach resort is conveniently located in the Crescent Beach section of North Myrtle Beach, South Carolina. Crescent Beach is a nice stretch of beachfront nestled between the nostalgic beach clubs and smooth shag dancing of the Ocean Drive area and Barefoot Landing where House of Blues, Alabama Theatre, waterfront dining and an eclectic array of shops come together. Bluewater Keyes is just a couple blocks from Highway 17 and so easy to find. The blue water of the Atlantic Ocean is only separated from this North Myrtle Beach resort by a white sandy beach that invites you to build sand castles and nap on beach towels. Cross the wooden boardwalk that traverses the sea oat-filled dune line and enter the oceanfront pool deck at Bluewater Keyes. This is one of two pool decks at this North Myrtle Beach resort. The oceanfront swimming pool glistens in the sunlight at Bluewater Keyes. Pick a lounge chair and spend your North Myrtle Beach vacation day relaxing, napping and reading in the sun by the pool. When your family stands poolside you cannot help but be awestruck by all the blue that surrounds you. From the sky to the sea and across the white sandy beaches to the bright blue swimming pool, the turquoise and teal meld together beautifully for an inspiring landscape. And you can enjoy this blue water-filled landscape every day of your North Myrtle Beach vacation when you stay at Bluewater Keyes. This oceanfront pool deck also features a kiddie pool, lazy river and hot tub. Everyone will have fun here!